The Waterfall of Chiflon Located about 60 miles southeast of San Cristobal or 30 minutes from downtown in the city of Comitan Tzimol in the middle of a valley of reeds, mountains and jungle, are the Las Cascadas el Chiflón, meaning "big whistle." The Waterfalls at El Chiflon are actually two waterfalls. The smaller one at the bottom is what gives the falls there name but the main waterfall.This is one of the most impressive fall in Chiapas and has stepped fall that measures up to 120 meters in height. It is formed by the waters of the San Vicente River, which is one of the largest in this Chiapaneca region. 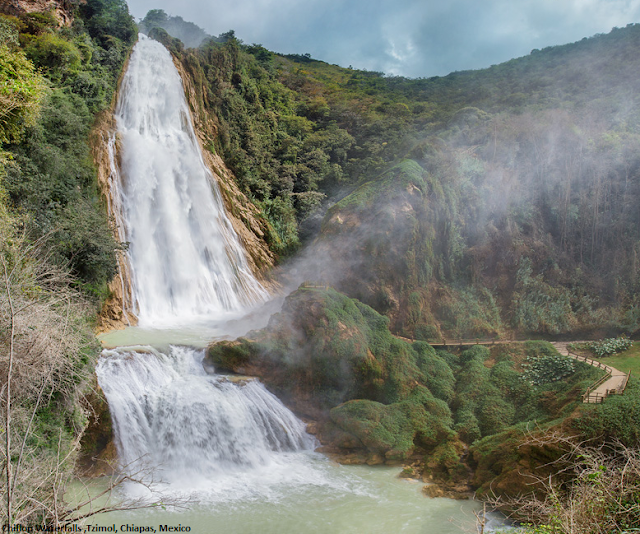 Chiflon Waterfalls is the place for maximum waterfall adventure in Chiapas, an eco-tourism center equipped with distinctive and varied facilities to make your stay unforgettable. Located about 30 minutes from Comitán de Domínguez in the municipal of Tzimol, one can get here via the Comitán-Tzimol federal highway. The Cascada Suspiro and Ala de Angel waterfalls are apt for swimming. Swimming is prohibited in the highest waterfall, Velo de Novia, due to the strong and violent current. There is an alternative trail that leads to several archeological ruins where cave paintings have been found. Chiflon is a great place to walk through the jungle and be one with nature, take pictures, swim and enjoy the diverse local dishes on offer. Chiflon Waterfalls awaits you to experience maximum adventure. Best time to visit -: May -Sep.